Today, the Statue of Liberty Commemorative Silver Dollar Coin remembers the busiest day for arrivals at Ellis Island on April 17, 1907. But what did the newspapers of the day report? Did they realize how many people arrived each day? Nearly 10,000, Mostly Italians, Arrived in Few Hours at Ellis Island. New York, April 18. — The spring rush of foreigners to this land of promise reached its apex today, when eight steamers that arrived this morning and late yesterday landed 9,874 persons at Ellis Island. A large majority of those are Italians. They were not searched for deadly weapons. The steamer Republic, from Naples, had banner list of steerage passengers, landing 2,212; the Carmania, from Liverpool was next with 2,142. Four vessels that arrived last Tuesday brought 6,247 passengers in the steerage. Over 10,000 Immigrants Land on Ellis Island. More Than One-third of Incoming Foreigners Are from Italy—Only Thin Scattering of Irish — Steamer Is Jammed to Utmost Capacity. Press Freight Vessels Into Service. New York, April 18. More than 10,000 immigrants passed through the gateway at Ellis Island today. In the past three days a fleet of ocean liners has brought to New York Harbor 18,900 foreigners, who have come to America to take part in the struggle with the other 90,000,000 already in the States. If tomorrow and Saturday’s arrivals continue in the same proportion, the week will surpass all records. avenge of 3,000 to be noteworthy. The immigration authorities at Ellis Island say that the indications are that this spring’s total of immigration will eclipse that of any other year, and that the year’s total will run well above the million mark. The vast majority of the arrivals are from the south of Europe. Of the 18,9000 who have arrived here Tuesday more than one-third are Italians. Another third comes from the south of Russia, Poland, Transylvania, and Hungary. Fifteen hundred are Finns. Only a thin scattering are Irish. There were a few hundred Germans from the Kaiser’s empire, and 1,000 French and Belgians. The steamship companies are jamming their liners to their full capacity, and the agents say they are compelled to leave thousands behind who are clamoring for immediate passage to America. Vessels that have been used exclusively for freight are being pressed into service to keep abreast with the demand for transportation overseas, and the German, French, and Italian shipyards are building trans-Atlantic liners to their full capacity in the expectation that there will be no falling off in the immigration to the United States for the next ten or twenty years. If today’s average were maintained for a year the population of the United States would be increased annually something like 3,500,000, without taking into account the babies born to the 90,000,000 people already here. Of course, it is not likely that any such average will be maintained, though it might be if there were ships enough to carry the host who desired to come. 16,121 Immigrants Arrive at New York in Two Days. New York, April 19. The present year promises to beat all records for the number of immigrants to the port of New York. Yesterday morning there were 9,874 on Ellis Island waiting to go through the formalities necessary before they set foot on the landing state at the Battery, free to go whither they please. These immigrants arrived Tuesday and yesterday, and 6,247 others arrived also, but had already passed through Ellis Island, making the grand total for the two days 16,121. The immigration officials say these figures constitute a new record for their department, and everyone on the island is working almost day and night to cope with the unprecedented rush. 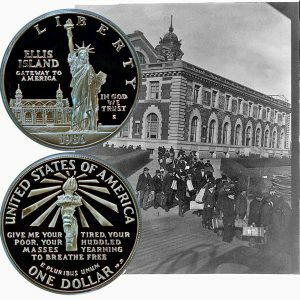 The Statue of Liberty Commemorative Silver Dollar Coin shows with an image, circa 1907, of arrivals at Ellis Island.